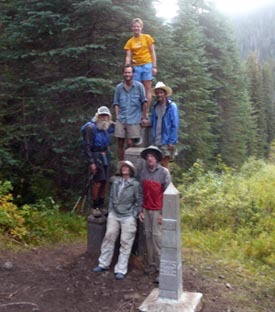 On April 21st Nimblewill Nomad embarked on yet another journey — o’er the Pacific Crest National Scenic Trail (PCT). Starting at the Mexican border, he hiked north, along the Pacific Crest National Scenic Trail (PCT), across California, Oregon and Washington, through the Sonoran and Mojave deserts, numerous national forests and wilderness areas, the Sierra Nevada and Cascade mountain ranges, to the Canadian border and the completion of this odyssey. This year’s journey also included a successful thru-hike o’er the John Muir Trail located in California. 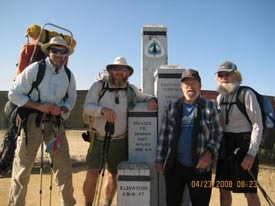 The Nomad started this hike with Dan Sheltowee Rogers and Kevin Slider Reardon, however early in the journey there were unexpected events that caused these fellow thru-hikers not to be able to finish the trail together. 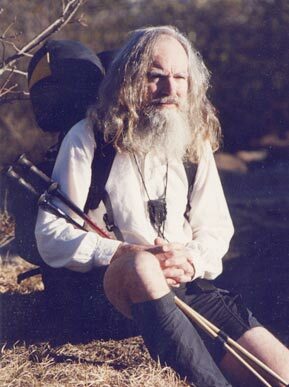 For the entire trek, the Nomad was assisted by Gordon Smith, also a long-distance hiker, who, along with sister, Sue Ellen Lockwood, transcontinental trekker, now deceased, has provided trek support to hikers for many years. This journey has proven to be very special, for upon completion, September 15th, the name Nimblewill Nomad has been added to that short list of intrepid who’ve completed the Triple Crown. You can find out more about this achievement by visiting the Triple Crown 2008 section. Be sure to check out the very detailed map of the magnificent places the Nomad visited this journey, his Itinerary, Gear List, Journal entries, and some pretty amazing photos and videos. Of particular interest, take a look at the Nomad’s completely revised Gear List. For previous odysseys, his pack consistently tipped the scales at or below ten pounds, (food and water excepted). For this odyssey, and with the aid of some great new sponsors, Nimblewill was able to reduce his packweight to below seven pounds!